Carrying on from my earlier post, the Bloody Tower is perhaps the most widely known building within the Tower’s walls. This particular tower, built by Richard III between 1238 and 1272, used to go by the slightly less terrifying name of ‘The Garden Tower’, but acquired its grizzly new title when it started to become a prime spot for dark doings and general nastiness. The most famous victims of the Bloody Tower are considered to be the two princes, Edward V and his little brother, Richard, the Duke of York. 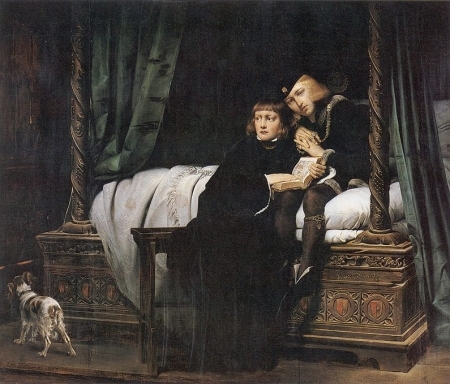 No one really knows what happened to the two princes during their imprisonment at the tower, but when they disappeared without a trace, fingers were waggled in the direction of their protector, Richard III, who had seized the crown shortly before Edward’s coronation which had been arranged for 22nd June 1483. In 1674, bones which were assumed to belong the two princes turned up beneath stairs leading to the chapel during works at the White Tower. These bones were later identified in 1933 as a mixture of human and animal bones but unfortunately the means to date the bones were unavailable back then, so we are still somewhat in the dark over their origins. However, this ambiguity has not stopped the rumours of the princes’ ghosts from haunting the tower. There is one story, dating from the late 15th Century, that tells of a guard who saw the ghosts of the children drift hand in hand down the stairs of the Bloody Tower, wearing the white nightshirts they supposedly died in. The two wraiths apparently then faded away into the shadows once more. A more recent event happened in 1990 when two Coldstream Guards reported hearing two children giggling outside the Bloody Tower and then the sound of something bouncing; perhaps the two princes have found some respite in a game of ‘kick about’ in the afterlife. There have apparently also been sightings of the two children cowering together in various rooms of the tower. 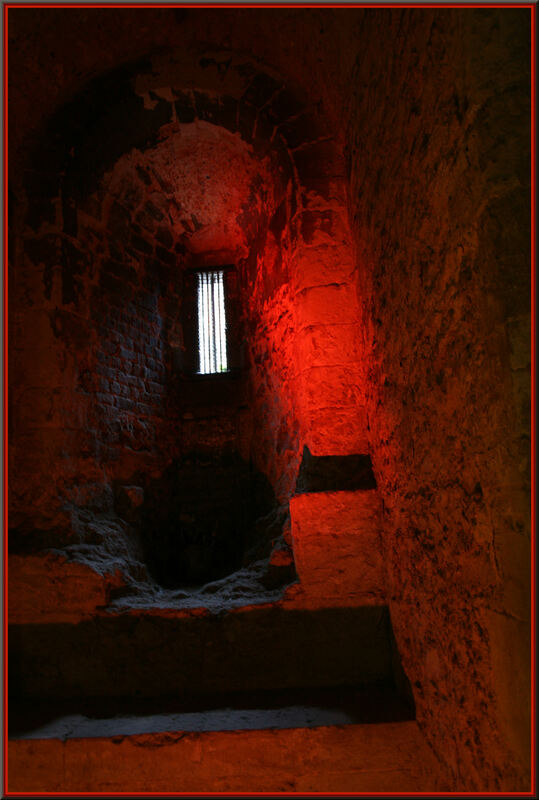 For me, one of the most intriguing sightings reported was one by a Captain of the Guard (date unknown) who said that one evening he had seen a strange light emanating from the Tower’s chapel, the Chapel of St Peter Ad Vincula. As the chapel was securely locked for the night, he climbed a ladder to peer through the window to see what was going on. What he saw must have scared the life out of him. As he peered through the glass he saw a procession of people in a very old style of dress with a strikingly elegant woman in the lead. The Captain of the Guard said that he had recognised the woman at the head of the procession as being Anne Boleyn from the portraits he had seen of her. After Anne’s execution, her decapitated corpse was placed in an arrow chest and buried within the chapel in an unmarked grave. The grave was rediscovered during renovations that were carried out during the reign of Queen Victoria. The grave has now been marked for everyone to see. Poor old Anne – she was a lot more graceful and forgiving on the scaffold than many would have been. Her goodbye speech was full of praise for King Henry VIII, which is a curious thing considering he was the one who condemned her to death so he could get his hands on another woman. For many people, myself included, the Tower of London is London. What started off as a mott and bailey castle in 1066 has been added to over the centuries until it became the impressive landmark we see today. Various towers have been added over time, many of which have been used to house prisoners. 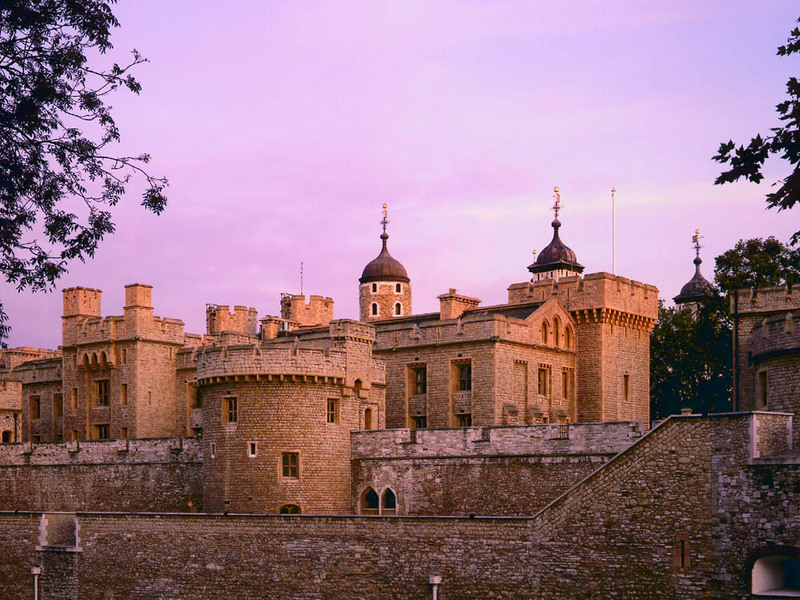 The White Tower, in particular, is infamous for having once housed a torture chamber within its depths – a place to be avoided at all costs! 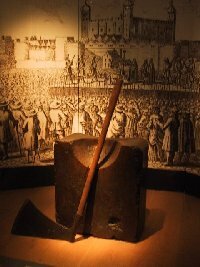 The Tower of London has a dark and grisly history with many a poor unfortunate meeting their end within its cold stone walls. 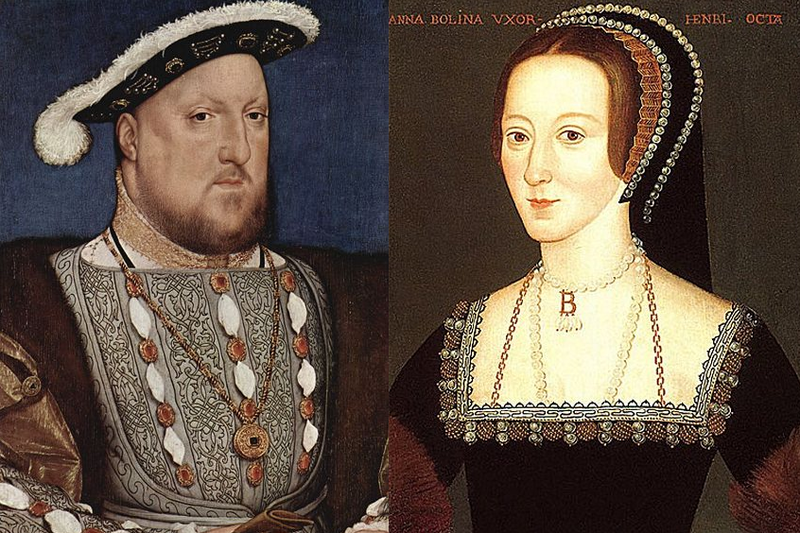 Perhaps the most well-known victim of the Tower was Anne Boleyn, the ambitious wife of Henry VIII. When Henry grew bored of Anne and fancied a different bit of totty, he decided to get rid of her in the only way he knew how: a visit to the scaffold. Anne may have gone to her death with dignity and grace, but the same cannot be said for poor old Margaret Pole, the elderly Countess of Salisbury. In 1541, Margaret fell foul of Henry VIII and was sentenced to death. Margaret, who was 68 years old at the time, wasn’t given a trial, just an appointment with the executioner. What they didn’t bank on was that Margaret wasn’t about to go without a fight and she led the executioner on a merry dance around the scaffold. This may sound like something out of a Benny Hill sketch but the gruesome truth of it is that it took many a blow from the executioner’s axe to dispatch the old woman, most of which missed her neck completely. The old countess may have been (eventually) silenced but her ghost is still reputedly seen on the anniversary of her death (27th May) desperately trying to escape from the executioner’s axe.